The “Black & White” apartments are situated in a 19th-century building, in the centre of old Krakow, mere 100 metres from the Main Square, one of the largest and the most beautiful European plazas. A two-minute stroll along Mikołajska Street brings you to the splendid Small Square surrounded by mediaeval houses, then past the magnificent basilica of Virgin Mary to the Main Square, the hub of city life. In its immediate vicinity, there are numerous landmarks and museums, as well as a wealth of cafés, restaurants, bars and pubs. 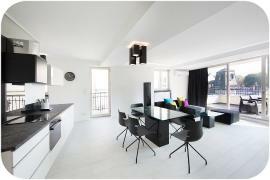 The apartment consists of 3 rooms, open-plan kitchen and 2 bathrooms. The sparkling new bathrooms include a shower (bath in the 2nd bathroom), generously sized washbasins, heated towel-rail. Big mirrors on the main wall enhance the feeling of space. Fully equipped open-plan kitchen is equipped with a ceramic hob, refrigerator, microwave + oven, coffee maker, toaster and other utensils. A washing machine and an iron are available as well. The “Black & White I” is one of two apartments available in the building. Together they offer comfortable accommodation for up to 16 guests.